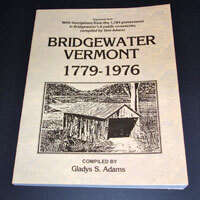 This book covers Bridgewater’s early history through 1976 with a supplement of 1, 784 gravestone inscriptions. It is soft covered and has 218 pages. This cookbook’s recipes reaches back into our great-grandmother’s files and was complied by Bridgewater ladies to celebrate the American Bicentennial in 1976. On the cover is a painting by Gilbert Fahey of the oldest surviving house in Bridgewater, Vermont circa 1797, the Captain Richard Southgate house which is now home to our town offices. Softcover, 85 pages. This calendar has 13 photographs which include Bridgewater’s famous Womanless Wedding Production, 1938 Flood, Josiah Josselyn house (now the Mennonite Church) and many other historic photographs. 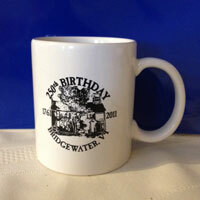 Items can also be purchased by sending an email with your request to the Bridgewater Historical Society. Add $5 postage for items mailed.